Words Cheat is a transparent overlay, that helps you generate the best results. -enter the letters you receive from Words with Friends, or other word game, into the 1st text box (Your Letters). 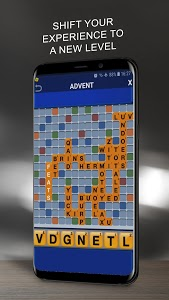 -enter any words or letters you find already on the board that you would like to build your word off, into the 2nd text box. You can specify your search mode by using the W, S, A buttons at the top of Words Cheat. If your opponent has just played "WIN"
S - Single Letters mode. Each individual word in board letters section will be used to produce a word. This will produce - (B)ADS, (C)ADS, (A)AS. Using each board letter separately. EITHER Here you can enter into board letters as: P?I to find words that will span this gap. -you can specify the placement of these board letters in relation to your word with the radio buttons 'start' 'end' and 'any'. check the screen shots for examples. -then just hit GO! It will provide you with a list of available words you can make, with the letters you have provided. -open wordscheat, hit menu then settings. -make sure "Words Cheat notification" is ticked. 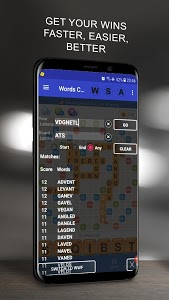 -open or switch to Words With friends. 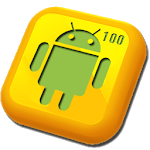 -once loaded, drag down your notifications bar and select wordscheat. -this should overlay it ! -Does not rely on an internet connection. -Fully functional, no restrictions, no forced paid content. -one simple unobtrusive banner ad at the top of the app, nothing else. 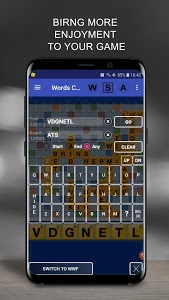 -Long press a word to access dictionary-optional transparency see game board through app! Some devices have been known to automatically hide WordsCheat's notifications. Please check the transparency setting - To do this, swipe from the left for the quick settings menu, then adjust the transparency slider. Case Clicker 2 - Custom cases!